I am trying to understand the numeric legends presented in the patient profile report. For laboratory domains, the data points denote the lab original finding results. How is the color of the data point determined ? The information on the legend explaining the color varaition do not synchronize with the results. How are the values assigned to gradient bar? It would make more sense if it can take values from original low/ original high reference ranges instead of cohort ranges (which I guess it is taking now). Is there an option to tweek this? Yup, that screen shot tells me everything I need. The version JMP Cliniical you have is JMP Clinical 6.0. I would talk to your site administrator (unless that is you) and request the latest release be sent to you (installed for you, depends on your internal processes). If you are the site administrator for JMP Clinical, then I would contact your local sales team and request the update from them to be sent to you. Once you have installed the latest version, then you will find the issues you have mentioned are resolved. Which version of JMP Clinical are you using? There was a change In JMP Clinical 6.1 that changed how the color gradient was determined. Now the gradient bar is off by default, and for lab data, the gradient represents reference ranges determined by LBSTRNLO and LBSTRNHI instead of by outlier detection ranges, if they are available. Otherwise, they are determined by outlier detection ranges. Outlier detection range is 1.5 X Inter Quartile Range of the Median. The lab dataset that I am using has LBSTRNLO & LBSTRNHI but still JMP calculates outlier detection ranges and shows that information on the gradient bar. There are still some ambiguities on the legend. Blue inverted triangle denote low values, grey dots signify normal according to legends in the report. But, I have grey-to-blue or grey triangles or red dots or blue dots, what does these mean. Is there an option to import these patient profiles into JMP and modify the settings and the legends. Thanks for letting me know the version number. This behavior sounds odd. I think you might want to contact Support (support@jmp.com) to figure out what is going on here. What is supposed to happen is that any value greater than or equal to HI should be denoted with a Red Triangle pointing up and anything less than or equal to LO should be denoted with a blue triangle pointing down. Everything in between will range from red to blue with grey being the midpoint between LO and HI. If you are seeing a grey down triangle, then there is something is not right either with the data or the installation of JMP Clinical. Previous versions of JMP Clinical (even 6.0) would have shown what you see, but this was supposed to be corrected in version 6.1. They might ask you for a screen capture of the offending triangles and gradient bars. Have you modified the Display Template by chance? One has to do this to make the gradient bars show up in JMP Clinical 6.1. IN previous versions, they were on by default. Thanks for the clarifications Chris!! I have submitted a ticket to JMP support team with a screen shot. I have not modified the Display Template, I am currently working on the default settings, which shows the gradient bar as well. Hmm. It sounds like you are working with a version of JMP Clinical that is before 6.1. The default template has the gradient bar off by default an the triangles would be appropriately colored. 6.0 and earlier versions have the gradient bar displayed by default and the colors of the triangles (and dots) did not match the reference values or value range. One way to find out which version you have is to go to the Settings button on the left hand side and then look for the About JMP Clinical section. See link included in this reply. To get the latest version (6.1.2) you can ask your Site Administrator at your company or contact your local sales team to request the update. Thanks Chris !!! 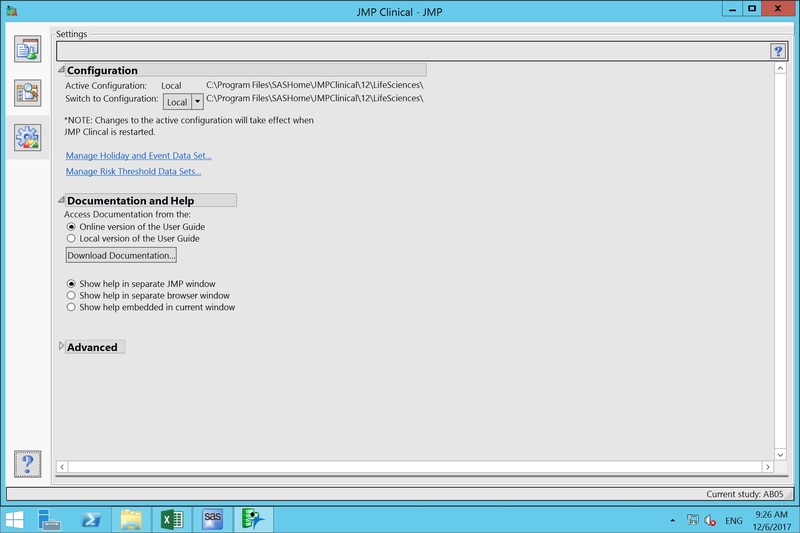 Please find attached my screenshot, it does does show the version of JMP Clinical. But I checked our license key and all it said was JMP 12.2. Thanks Chris !! I shared this information with my site administrator, and they will process this request shortly.